64GB Kit 8x 8GB DELL POWEREDGE R910 R915 C1100 C8220 M710hd T710 Memory Ram. Hover over the Thumbnail to enlarge. DELL POWEREDGE R910 R915 C1100 C8220 M710hd T710. A2626071 A2626092 A3721494 A3721500 A3721505 Snpp9rn2c/8g. These are all Brand New and/or New Condition Pulled Modules. These are all ECC Registered Modules! These are mainly for servers and will only work in a small fraction of desktops and workstations! PLEASE DOUBLE CHECK SYSTEM COMPATIBILITY! With hundreds of suppliers in our database at all levels of the supply chain, we are able to source the highest quality components at the lowest possible prices. Memory upgrades have never been easier. Designed specifically to help your computer run faster and smoother, an A-Tech memory upgrade is one of the fastest, most affordable, and easiest ways to improve your system's performance. A-Tech memory empowers your computer to achieve faster application loading times, faster system responsiveness, and increased ability to multitask and handle data-intensive programs. A-Tech modules are rigorously tested to ensure that your memory meets our stringent compatibility and performance standards. Every A-Tech ram module is tested for complete functionality before it leaves our doors. Give your computer the best, trust A-Tech! We have professionals ready to help you with any questions that you may have about purchasing, installing, or upgrading your computer memory. 4GB Module DELL POWEREDGE R910 R915 C1100 C8220 M710hd T710 Memory Ram. 16GB Kit 4x 4GB DELL POWEREDGE R910 R915 C1100 C8220 M710hd T710 Memory Ram. 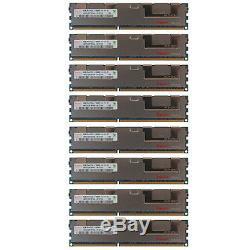 32GB Kit 8x 4GB DELL POWEREDGE R910 R915 C1100 C8220 M710hd T710 Memory Ram. 8GB Module DELL POWEREDGE R910 R915 C1100 C8220 M710hd T710 Memory Ram. 32GB Kit 4x 8GB DELL POWEREDGE R910 R915 C1100 C8220 M710hd T710 Memory Ram. PC3-12800 1.35V 16GB Module DELL POWEREDGE R910 R915 C1100 C8220 M710hd T710 Memory Ram. PC3-12800 1.35V 64GB Kit 4x 16GB DELL POWEREDGE R910 R915 C1100 C8220 M710hd T710 Memory Ram. PC3-12800 1.35V 128GB Kit 8x 16GB DELL POWEREDGE R910 R915 C1100 C8220 M710hd T710 Memory Ram. The item "64GB Kit 8x 8GB DELL POWEREDGE R910 R915 C1100 C8220 M710hd T710 Memory Ram" is in sale since Wednesday, November 4, 2015. This item is in the category "Computers/Tablets & Networking\Computer Components & Parts\Memory (RAM)".